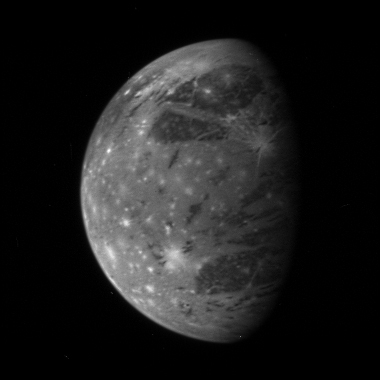 This is New Horizons' best image of Ganymede, Jupiter's largest moon, taken with the spacecraft's Long Range Reconnaissance Imager (LORRI) camera at 10:01 Universal Time on February 27 from a range of 3.5 million kilometers (2.2 million miles). The longitude of the disk center is 38 degrees West and the image scale is 17 kilometers (11 miles) per pixel. Dark patches of ancient terrain are broken up by swaths of brighter, younger material, and the entire icy surface is peppered by more recent impact craters that have splashed fresh, bright ice across the surface. With a diameter of 5,268 kilometers (3.273 miles), Ganymede is the largest satellite in the solar system. This is one of a handful of Jupiter system images already returned by New Horizons during its close approach to Jupiter. Most of the data being gathered by the spacecraft are stored onboard and will be downlinked to Earth during March and April 2007.